Don’t be shy. 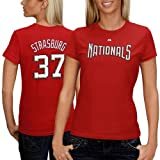 Show Stephen how you really feel in this Washington Nationals Women’s Name & Number Tee. Features screenprint decoration on front and name and number on back. This entry was posted on May 24, 2011 at 4:03 pm and is filed under Washington Nationals. You can follow any responses to this entry through the RSS 2.0 feed.